Broker consensus tells you how a stock is rated by City institutions. It gives you the consensus buy/hold/sell rating and can be drawn from multiple City institutions and brokers who look at all aspects of the companies before taking a view. Broker Consensus data is updated on a daily basis in ShareScope. You can add broker consensus ratings to the List screen, Details screen and use it as criteria in Data Mining filters. We will look at each one of these in turn. A Broker Consensus column can be easily added to List screens in ShareScope - including portfolios and the Data Mining screen. To add a column, hover the mouse over any column heading and right-click to bring up the context menu. From the menu that appears, select Add General Column and then Broker Consensus. You can reveal more information about the consensus by hovering the mouse over the rating. A tool-tip will appear providing details of consensus change, previous consensus and number of analysts. Note: In ShareScope Plus and Pro, the individual forecasts and ratings made by each broker will also be displayed, as illustrated in the example below. Broker Consensus data may also be displayed numerically in the List screen. To change the format, simple right-click on the column heading and select Display as number from the menu. 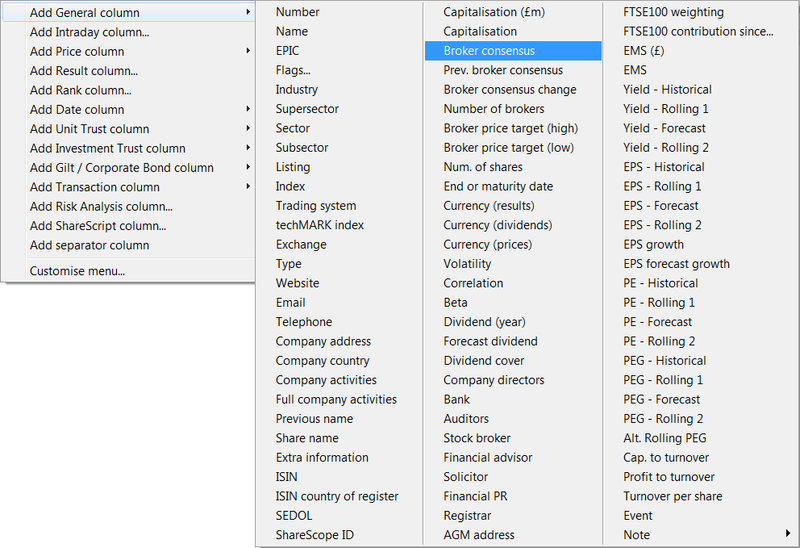 Following the same steps as before, you may also add separate Previous Broker Consensus, Broker Consensus change and Number of brokers columns to the list screen. Note: the broker consensus only changes when ShareScope receives a forecast from an additional broker or when one of the existing brokers covering the stock updates its previous forecast. You may wish to group together shares with similar broker consensus ratings. To sort a column, simply double click on the column heading. Double click again to reverse the order. Broker Consensus data can also be displayed in the Details screen. Right-click anywhere in the Details screen. Select New List box from the context menu. A new blank box will appear on the screen. Right-click inside the list box and select Add List Box item from the menu. As with List screens, you can also add Previous Broker Consensus, Broker Consensus change and Number of brokers to the List Box. Data Mining can be used to generate a list of stocks based on the Current consensus, Previous consensus, consensus Change or the Number of Brokers on which the consensus is based. Let's begin by searching for stocks with a broad buy rating. Click on the Select Filter button and select either an existing filter or create a new one. In this example we will select New Filter. Give the filter a name of your choice and select OK.
Click on the Add Criterion button to start the Data Mining wizard. Select Other criteria and click Next >. 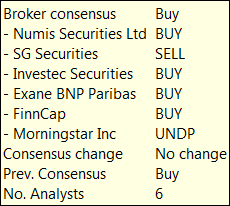 Select Broker consensus and then click Next >. Select Current consensus and press Finish. After a moment, a criterion box labelled Broker Consensus will appear on the right of the screen. Initially, the lower and upper limits will appear at their greatest available values. As we are only interested in displaying stocks with a broad buy rating we need to specify a range of between 0 and 3.5 (Strong Buy - Weak Buy). So, in the left box, we enter 0 and in the right box 3.5. Press Enter to filter the results. By adding a Brokers Consensus column in your Data Mining screen, you will notice that all stocks with a Broker rating lower than Strong Hold are excluded from the list. Now let's say, we want to look for stocks that have seen a positive change in the Brokers Consensus rating - in other words where sentiment towards the stock has improved. In the wizard, select Other criteria and click Next >. Select Change and then press Finish. A second box labelled Broker Consensus will appear on the screen. As we are looking for an improvement in rating, we will need to search for stocks with a positive range - because a negative value would denote a fall in sentiment. The lowest possible positive number we can enter in a filter box is 0.01, so in the left hand box enter 0.01. As the right hand box by default displays the maximum possible positive value, we leave this unchanged. Press Enter to display the results. In ShareScope Plus and Pro, you can view detailed broker forecasts including the date the forecast was made, the recommendation (e.g. buy) and the actual forecasts for turnover, profit, EPS and dividend. This data is important as it forms the basis of the broker consensus. To display the broker forecasts for a particular share, right-click on the selected share in a list screen and select Share's Broker Forecasts from the context menu. Alternatively, for fast access, you can use the keyboard shortcut Shift-# to skip straight to the screen. You can of course use the multi-window functionality in Plus/Pro to create an entirely new window. Simply right-click in any window and select New Window : Broker Forecasts. As with other screens in ShareScope, you can use the Find a Share function to locate items - simple begin typing the name of the share on your keyboard. The image above displays the default layout for Setting 1. However, you can add additional columns and customise the layout as you would any other List screen. Company name - click on the arrow buttons either side of the name to view the forecasts for the next/previous company in the underlying list. Year ending - this is the year that the forecast is for. By default, this will be the current (unreported) year. ShareScope will include up to three years" forecasts for each company. Click on the arrows to view the forecasts for the next/previous year. Show min. and max. values - ticking this box enables you to see, at a glance, the range of values forecast for each item (e.g. EPS). Skip if no forecast - for some companies there will be no forecasts. Tick this box to skip these as you move through the underlying list.